His remarkable speech at the DNC put racial, social, and economic justice at the center of the 2016 campaign. Nation readers are well acquainted with Dr. Rev. William Barber II, this magazine’s civil-rights correspondent, but most Americans have never heard of him. Last night was his coming-out party, when he brought down the house with an incredible speech at the DNC just an hour before Hillary Clinton took the stage. 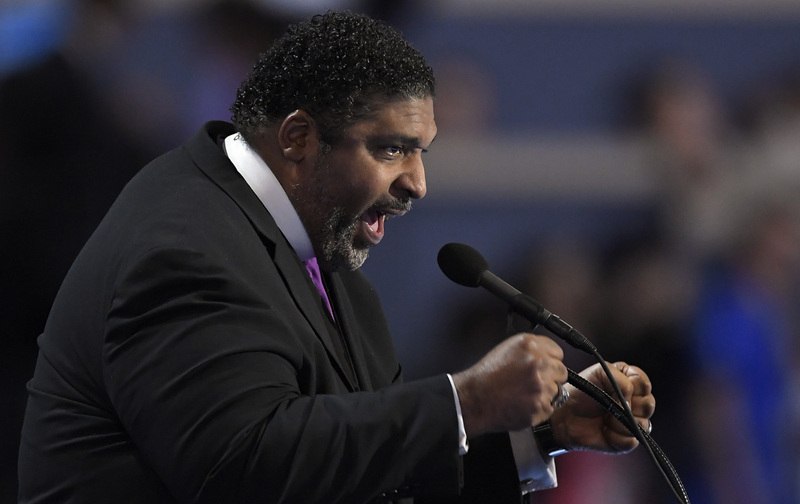 As the leader of the North Carolina NAACP and the Moral Monday movement, Barber is leading a multi-racial and multi-issue struggle for racial and social justice that the South hasn’t seen since the 1960s. He’s been traveling the nation in recent months calling for a moral revival—similar to the “revolution of values” that Martin Luther King Jr. once preached—and he distilled that message in a barn-burning 10-minute speech last night. Barber is one of the most gifted organizers and orators in the country today. As an organizer, he’s showed the power of civil disobedience and nonviolent direct action to mobilize a broad coalition against shameful policies like HB2 and the country’s worst voting restrictions in North Carolina. As an orator, he’s reclaimed the language of faith from bigots like Pat Robertson and Jerry Falwell. I say to you tonight, there are some issues that are not left versus right, liberal versus conservative, they are right versus wrong. We need to embrace our deepest moral values and push for a revival of the heart of our democracy. When we fight to reinstate the power of the Voting Rights Act and to break interposition and the nullification of the current Congress, we in the South especially know that when we do that, we are reviving the heart of our democracy. When we fight for $15 and a union, and universal health care, and public education, and immigrant rights, and LGBTQ rights, we are reviving the heart of our democracy. When we develop tax and trade policies that no longer funnel our prosperity to the wealthy few, we are reviving the heart of our democracy. When we hear the legitimate discontent of Black Lives Matter we come together to renew justice in our criminal justice system, we are embracing our deepest moral values and reviving the heart of our democracy. When we love the Jewish child and the Palestinian child, the Muslim and the Christian and the Hindu and the Buddhist and those who have no faith but they love this nation, we are reviving the heart of our democracy. When we fight for peace and when we resist the proliferation of military style weapons on our street, and when we stand against the anti-democratic stronghold of the NRA, we are reviving the heart of our democracy. We must shock this nation with the power of love. We must shock this nation with the power of mercy. We must shock this nation and fight for justice for all. We can’t give up on the heart of our democracy, not now, not ever! I was surprised to see Barber speak at the DNC. He’s rarely endorsed candidates and been careful not to get too close to the Democratic Party, which he’s also taken on over the years. So it was great to see the Clinton campaign—known for its caution and carefulness—give a huge platform to a leader who is so bold and honest. I asked Barber this morning why he spoke at the DNC. He told me, “I didn’t ask to speak or seek to speak. We tried to deliver our higher ground moral declaration to the RNC—they refused to meet with us. We did deliver it to the DNC. “The stuff at the GOP convention that literally bordered on heresy—when I hear a candidate say ‘I alone can fix’ that, that’s like hearing Caesar talk during the days of Jesus or the bad kings during the days of the prophet. “I prayed about if the opportunity came [to speak at the DNC], I might consider it, in light of this political idolatry that Trump represents. These are times that try men and womens’ souls. We have not heard the type of things we’ve heard from Trump since George Wallace in 1968. The issues Barber raised in his speech, like the fight for voting rights, have often been at the fringes of the presidential campaign, but deserve to be at the center. His speech was a hopeful sign that the struggle for racial, social, and economic justice will be defining issues in 2016.